Like a lot of you, I’m still adjusting to being back at work after the holiday season and the inevitable January sick days. Standing right in my path: a world of distractions on top of the winter drags. But I’ve found a trick that’s helping me tremendously: light a candle. Well, technically, I light a candle and put on my headphones. Why does this work? Why might it work for you? My brain wanders when I’m trying to read and write. It veers wildly from shopping lists to new workshop ideas with no sense of direction at all. This kind of mental motion makes it hard to focus. But to light a candle, I have to focus. Take the match out of the box, strike match, put that burning flame to the candle wick. It takes just a little bit of full concentration, and that’s enough to bring me to the present. 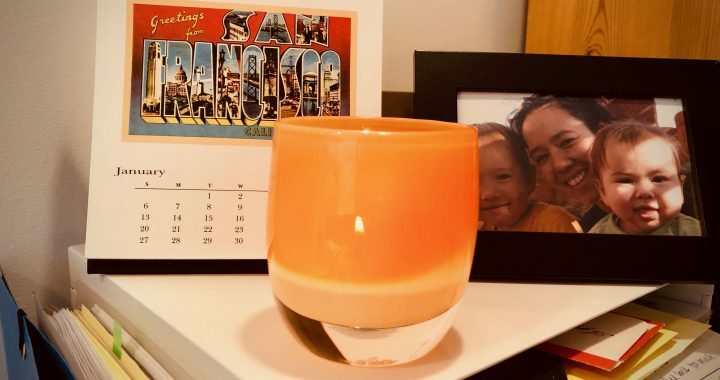 I’ve even gone so far as to have a scented candle for my morning pages and votive in a beautiful Glassbaby glass for work. So the scent becomes a signal to my body that it’s time for creative work. If my mind or the house is particularly noisy, I also put on my headphones. They’re wonderful noise-cancelling headphones and I listen to the Calm and Focused playlist on Spotify very softly. Now that I’ve been doing it for a few days, particularly in the mornings, I’ve noticed that they also help me focus. They seem to serve a double function: blinders and headphones. Creative work is hard work and we can all use all the help we can get. Do you have rituals you use to get yourself in working mode? Please share them and inspire someone else who’s working hard, too! Posted in Personal Stories and tagged productivity, rituals. so important to find rituals to keep focus! Great work, keep writing! They work a wonder. I’m becoming a believer. Plus it smells nice, too! StoryCraft : KvK 68291167 : © 2019 : contact info@storycraft.nl.